The winner of the EU Prize for Literature, Land of Love and Ruins introduces a daring new voice in international fiction: Oddný Eir. In the wake of Iceland’s financial crisis, a young author, recently separated and feeling out the uncertain terrain of a new relationship, finds herself questioning the foundations of our love and family lives, our bonds to country and the earth. Stirred by a dream about an old Viking woman on a pilgrimage, she sets out on a quest to the the ruins of the homes of her ancestors, where they tried to live in harmony with nature and each other. Her guiding questions are as essential as their answers are elusive: How do we create a home for love? How can we nourish personal space while sustaining intimacy and desire with a partner? How can we go, not back, but forward to nature? Drawn both to her archaeologist brother and her ornithologist lover, she explores alternate forms that those relationships might take. Her search brings her all over Iceland and abroad to Paris, Strasbourg, Basel, and the Lake District home of famous Romantic siblings Dorothy and William Wordsworth. Written in the form of a diary that pans from small details to big questions and weaves elements of philosophy, history, archaeology, ecology, eroticism, and literature into a beautifully patterned whole, Oddný Eir invents a new, intimate language between writer and reader in this enchanting book about being human in the modern world. Oddný Eir Ævarsdóttir (1972) is an Icelandic author. She has received advanced degrees in political philosophy from the University of Iceland and The Sorbonne. In addition to publishing four novels and several books of poetry and essays, she has worked in the art world as a lecturer and gallerist, has received a grant to study archives and museums in Iceland, has been an environmental activist, and has collaborated with the musical artist Björk in composing lyrics for her albums Biophilia and Vulnicura. 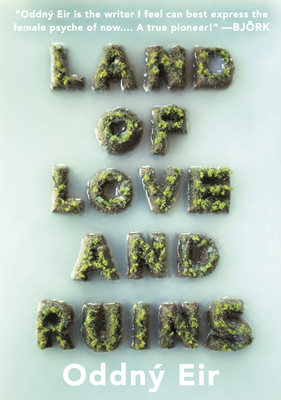 Land of Love and Ruins won the EU Prize for Literature and the Icelandic Women’s Literature Prize. Oddný Eir lives in the Icelandic countryside, by the glacier Eyjafjallajökull. Philip Roughton is an award-winning translator of Icelandic literature, currently residing in Reykjavík. He earned a PhD in Comparative Literature from the University of Colorado, Boulder, with specialties in medieval Icelandic, medieval Chinese, and Latin literature, and wrote his dissertation on medieval Icelandic translations of saints’ and apostles’ lives. He has taught modern and world literature at CU-Boulder, and medieval literature at the University of Iceland. His translations include works by many of Iceland’s best-known writers, including the Nobel laureate Halldór Laxness, Jón Kalman Stefánsson, Bergsveinn Birgisson, Steinunn Sigurðardóttir, and others. He was recently awarded the 2015 American-Scandinavian Foundation Translation Competition Prize, for his translation of Halldór Laxness’ novel Gerpla (Wayward Heroes). "[In Land of Love and Ruins] passages sometimes verge on the poetic, and a beautiful, satisfying insight can often be its own reward, no matter what it contributes to the broader narrative . . . Land of Love and Ruin is a rewarding, if deeply reflexive little book. It pokes and prods at philosophy and sociology, but never excessively, always couching them in a framework of feeling and everyday life. The diary mode is again a useful vehicle for bringing together such varied directions: the narrator’s musings range from Icelandic sagas to Greek mythology; from Confucianism to Hannah Arendt . . . Land of Love and Ruins is a meditation on the present condition, on how our fragmented emotional selves correspond to our fragmented economies, on how progressive-minded, socialist and feminist selves can still find solace in old traditions and familial histories . . . There are no conclusions to be found in such a work, which borders the poetic and prose, memory and fiction. The pleasure here is to be found in the journey."